Are you are one of the generous souls hosting Thanksgiving dinner this year? If so, then this post is for you. If you have stepped foot in the grocery store at any time this past week I am sure you are well aware of the holiday rush that has begun. I went to to Trader Joe’s the other day, it was a scary experience. Frantic, frazzled shoppers going every which way. Have you made a plan for next week? There are SO many things to do on top of your usual busy schedule: things like cleaning your house, buying items at the grocery store you never would purchase until this unusual US cultural phenomena takes control over you and steers you directly to the marshmallows because you just have to make what I like to call White Trash Sweet Potatoes. Once you survive the grocery shopping, you then have to unpack and store all those strange items until you find time to actually prepare them. Instead of grumbling about all the holiday craze you also try to stay aware that this holiday is about gratitude and you really should be thankful you can actually afford the damn marshmallows. Many people are struggling just to pay basic bills during this time. If any of this sounds familiar you are probably at the tipping point of entering crazy land. I have a few suggestions to help make this week go a little smoother. 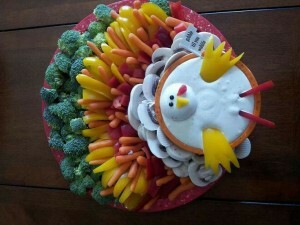 One of the best ways I’ve found to keep it together and organized for Thanksgiving is to be a traditionalist. I make great-grandmother’s stuffing every year. I make mashed potatoes with bacon and cheese every year. I make asparagus and corn…you guessed it…every year. Any fanciness comes from guests. This year my cousin is bringing two pies and two bottles of vanilla vodka. WooHoo! Keeping it traditional (whatever YOUR traditions are) means you get the same stuff every year, which means shopping gets easier every year because you eventually have your list memorized. This year I’m doing the Pioneer Woman mashed potatoes so I had to add cream cheese to a Thanksgiving list that usually doesn’t have it. No biggie. Thanks for a great article!